Skool Is Out @ Bruntsfield Centre is currently registered to accommodate up to 75 children (Mon – Thur) and has undergone a significant refurbishment boasting new kitchen and toilet facilities throughout the premises as well as secure entry systems. The venue has a large upstairs hall ideal for indoor sports as well as space for art activities and quieter activities, and substantial wall space for displays. We also have use of quieter play spaces in our downstairs rooms as well as a designated outdoor space. 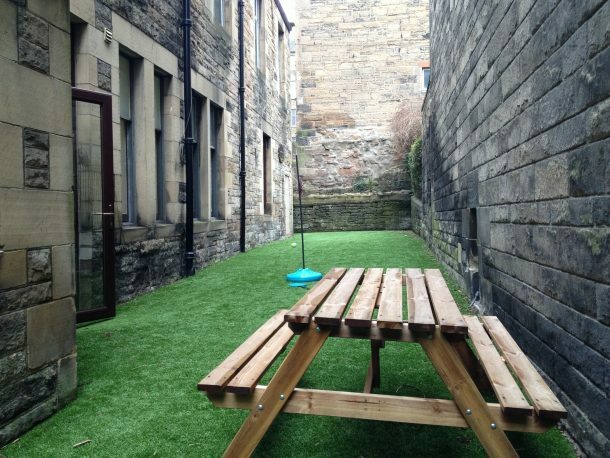 The outdoor area constitutes a walled-in garden with picnic tables and an astro-turf area for ball games including football and swing-ball and we currently offer both music and art & craft workshops in our downstairs rooms. We aim to offer our primary 4-7 children a relaxed, friendly and supportive environment where they can socialise with friends and engage in self-lead, free play, as well as structured activities. A large part of our ethos for the p4-7 club is to help children in the transition to high school; we aim to help children build friendships to help facilitate a smooth transition. On a Friday, as there are fewer children attending the service as a whole, all children are based down at Barclay Viewforth Centre where the primary 4-7 children have the opportunity to integrate with our younger p1-3 children, allowing siblings to play together and giving opportunities for the older children to assist the staff team in helping play and supporting the younger children attending. We also plan regular outings on a Friday afternoon to places of interest, museums, local parks and swimming pools.